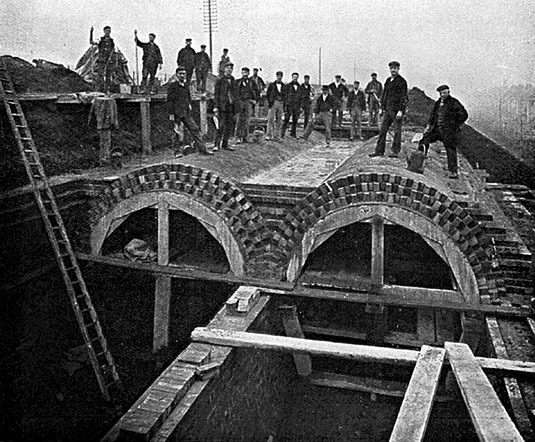 [Image: London's sewers under construction; via the fascinating Sewer History site]. 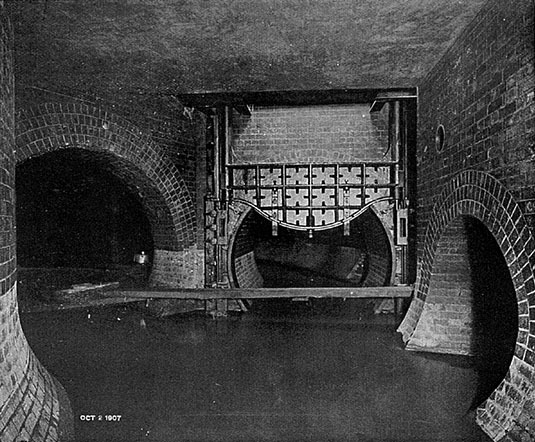 At one point in his recent overview of all things under London, from plague pits to bank vaults and buried rivers to Cold War government bunkers, author Peter Ackroyd quips that descriptions of the humid and microbiologically overgrown tunnels of the city's sewers "might be a narrative from the swamps of Borneo rather than the City of London." 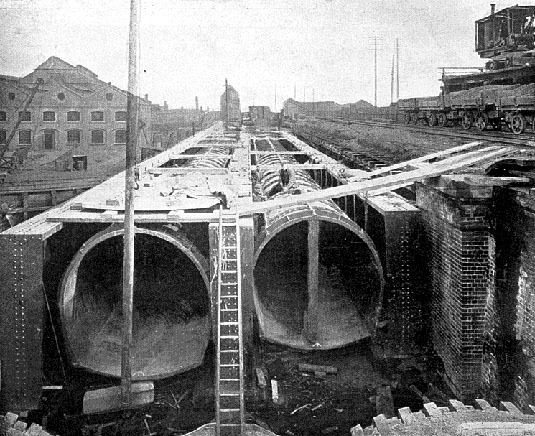 In a chapter appropriately called "Heart of Darkness"—"this was the heart of darkness," Ackroyd writes, "the lowest depth of a city that was already being described as a wilderness"—Ackroyd introduces us to several centuries' worth of sewer work, including the "flushers" or hardy laborers hired to enter the tunnels physically and help push—or "flush"—the waste out from sites of stagnation. 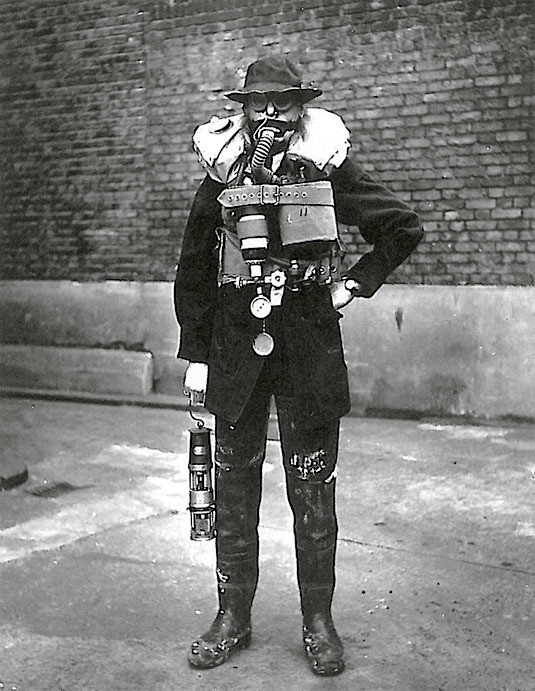 [Image: A "flusher," courtesy of Sewer History; for those of you interested in the state of "flushing" today, don't miss Edible Geography's interview with Julio the sewer diver, or this look at "fatbergs" in London]. "A survey of the sewers of London was undertaken in the summer and autumn of 1848," Ackroyd writes, "when their condition was described as 'frightful'; the system was dilapidated and decayed, even dangerous." 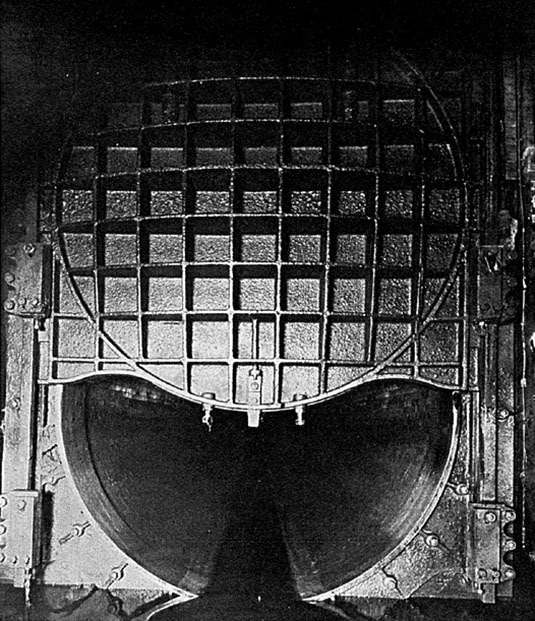 Workers sent below encountered titanic rooms dripping with grotesque stalactites made from human waste, mushrooms nearly "as large as ordinary soup-tureens" growing on the brickwork, and such poor and unventilated air that some surveyors had to be "dragged out... in a state of insensibility." This only increased the sense of near-unearthly wonder that colored popular descriptions of the city's artificial underworld: "The reports of the world beneath are written in a generally breathless tone, compounded of fear and awe." The underground chambers are compared to cathedrals, complete with pillars and buttresses, arches and crypts. One visitor, discovering an archway through which a cataract tumbled, remarked that it was as fantastic a scene as 'a dream of a subterranean monastery.' The travelers walk along tunnels that may reach a height of 17 feet, the cool tainted water lapping at about knee-height around their waders. Many are disconcerted by the pull of the water, and feel disoriented; they lose their equilibrium. They feel the sediment beneath their feet, as if they were walking on a beach at low tide. Great iron doors loom up at intervals, actings as valves. The noise of roaring water, somewhere in the distance, can generally be heard. It is the sound of cataracts and waterfalls. It is here, on this literal beach beneath the streets, that Ackroyd makes the tropical implications most explicit, where a landscape more like "the swamps of Borneo" is discovered, an urban tropics, steaming and wild under London.